Stereo music lovers, meet the Cambridge Audio Topaz SR20. Stereo music lovers, meet the Cambridge Audio Topaz SR20. 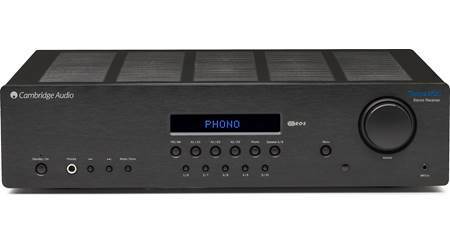 An outstanding value considering its audiophile-grade parts and construction, this receiver has connections for eight different audio sources, including three digital inputs. The inclusion of a Wolfson digital-to-analog converter means clear sound with depth and detail from streaming media players, Blu-ray players, and more. A direct connection for a turntable lets you enjoy your music on vinyl without the addition of a phono preamp, and the versatile front-panel minijack connector gives you an easy connection for most any kind of MP3 player or portable device. Two pairs of speaker outputs let you drive a second pair of speakers or bi-wire compatible speakers for optimal performance. And a connection for an optional powered subwoofer lets you enjoy the full sound of a 2.1 stereo system. At the heart of the SR20's powerful sound is a Class AB amplifier fed by a toroidal transformer that makes its 100 watts per channel sound like significantly more. Every time Cambridge reps come here to share demos with us, I'm blown away by the room-filling sound coming from what seems a modestly-powered amp, spec-wise. Whether you pair the SR20 with floor-standing speakers or compact satellites, your listening room will be filled with incredibly pure, detailed sound. And to top it all off, the receiver's stylish and functional metal casing provides acoustic damping to reduce distortion caused by vibration for the cleanest possible performance. Perfect receiver for a HiFi system - love it!!! can this be turned on with the remote and not having to turn the power on in the back? Yes by putting it in the standby mode [blue light] the remote will function perfectly! 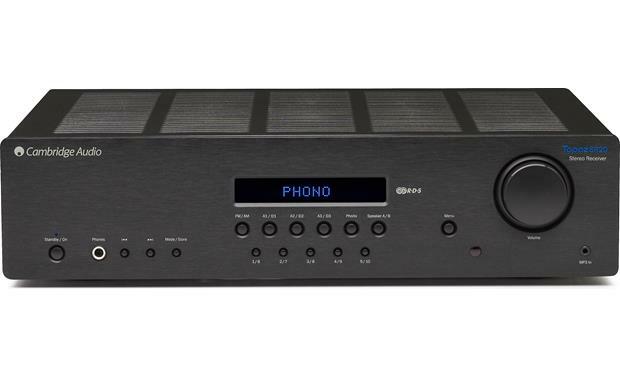 Stereo Amplifier: The Cambridge Audio SR20 stereo receiver employs a fully-discrete, high-power, class A/B amplifier rated at 100 watts RMS x 2-channels. The amplifier can handle impedances between 4 and 8 ohms. High quality power output to the amplification circuits, with no clipping, transformer noise, buzz or hum, to provide a consistent signal. High power output, to allow large and demanding speakers to be driven at high volumes with sensational bass performance. Large power reserves, to allow the transformer to deliver high peaks of volume when required. Fully shielded against internal and external electrical interference, to maintain quality of power and signal. Acoustically Damped Metal Chassis: Electronics (and therefore sound quality) are particularly susceptible to vibration; that's why Cambridge Audio used a low resonance, acoustically-dampened metal chassis to eliminate as much vibration as possible, ensuring that the most sound quality is extracted from every source. Wolfson DAC: The Cambridge Audio SR20 stereo receiver utilizes a 24-bit/192kHz Wolfson DAC (digital-to-analog converter) for exceptional sound quality. Inputs: The Cambridge Audio SR20 stereo receiver features a variety of connectivity options with analog, digital, and phono inputs. 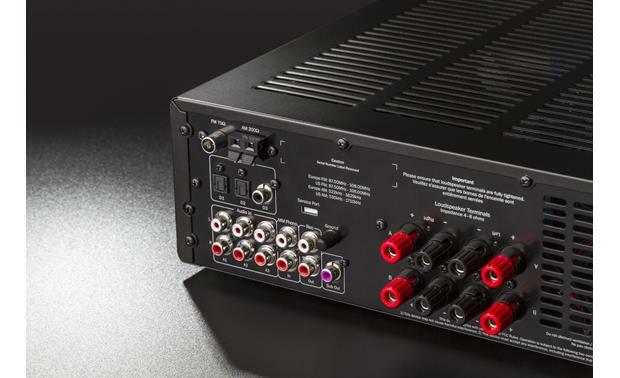 Digital Inputs: The SR20 offers digital connectivity with two optical (toslink) digital inputs and one coaxial (RCA) input. The digital inputs will accept 2ch PCM audio. The optical input supports up to 96kHz, while the coaxial input supports up to 192kHz. 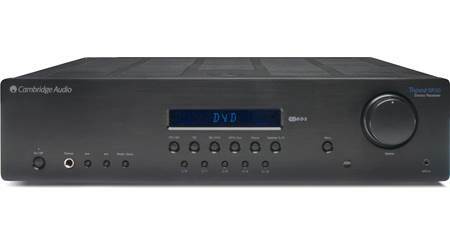 Analog Inputs: The stereo receiver includes a total of five analog audio inputs; 3 stereo RCA inputs, Phono input, and a front-panel 3.5mm input. 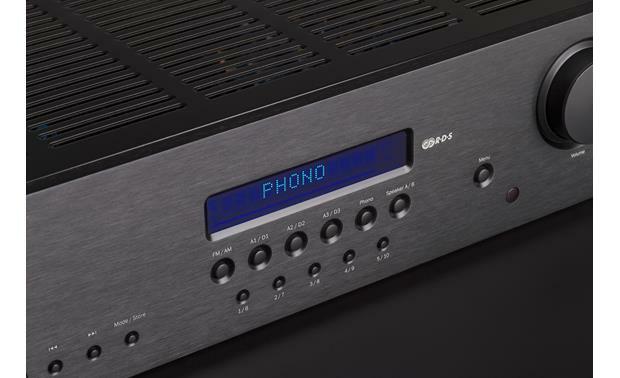 Phono Input: The SR20 features a Phono input for connection of your turntable. Turntables fitted with phono cartridges of either the Moving Magnet (MM) or high output Moving Coil (MC) type (between 2-6mV output and 30-50k load impedance) can be used. 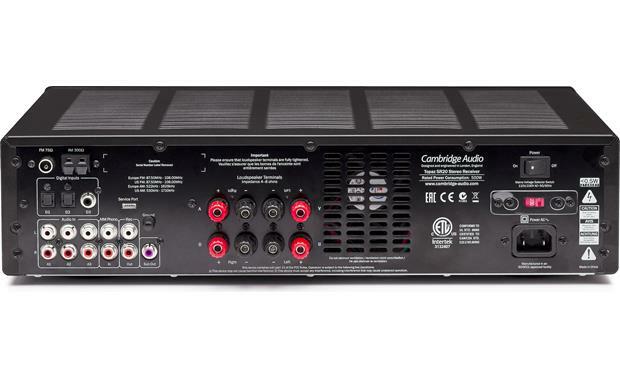 Front-Panel Aux Input: The Cambridge Audio SR20 stereo receiver features a front-panel 3.5mm auxiliary input for temporary connection of a portable digital audio player. Connecting an audio device to the front-panel 3.5mm auxiliary input will override the unit's rear-panel RCA auxiliary input. AM/FM Tuner (w/ RDS): The Cambridge Audio SR20 stereo receiver features a built-in AM/FM with manual, seek, and preset tuning. You can store up to 30 AM/FM station presets (15 each). The built-in AM/FM tuner features RDS for station name display on FM stations that support this function. For low quality stereo FM signals, selecting the Mono mode can reduce the noise and improve reception. You can also select between US or European tuning. Outputs: The Cambridge Audio SR20 stereo receiver offers A-B speaker outputs, a mono-RCA subwoofer output, and front-panel headphone jack. 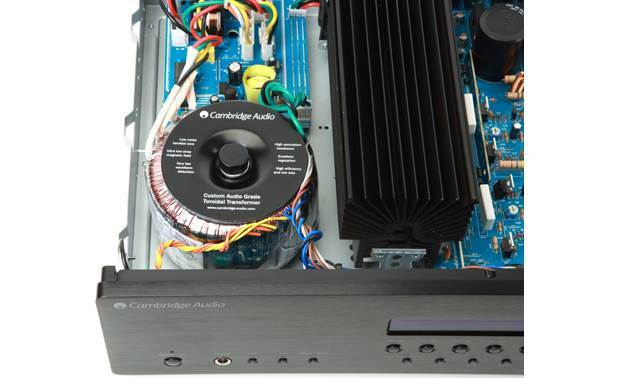 A-B Speaker Outputs: The Cambridge Audio SR20 is equipped with A & B speaker terminals to connect two pair of loudspeakers or bi-wire a single pair of loudspeakers. You can select which speaker outputs are heard - A speaker only, B speaker only, A+B speaker, or Off. The amplifier can support a 4-ohm load when driving only one pair of speakers. The amplifier can support an 8-ohm load when driving two pair of speakers. Subwoofer Output: A single rear-panel mono-RCA subwoofer output is used to connect a powered subwoofer for a 2.1ch speaker system. The sub out has a fixed 200Hz low pass filter. Record Output: There is a stereo Record Output for connecting a CD recorder. Headphone Jack: The Cambridge Audio SR20 stereo receiver is equipped with a front-panel 1/4" headphone socket for connection of a set of headphones. The amplifier's speaker outputs are muted when headphones are connected. Headphones with an impedance of between 32 and 600 ohms are recommended. Controls: The Cambridge Audio SR20 features front-panel controls and comes supplied with an IR remote control for wireless operation of the stereo receiver. The included remote control will also operate playback function of the Cambridge Audio CD10 CD player (779CD10, sold separately). Volume: The Cambridge Audio SR20 features a front-panel rotary dial to increase or decrease the level (-80 to 0) of the sound from the speakers outputs and headphone output of the unit. You can also use the included remote control to adjust the volume level. Bass & Treble: The Cambridge Audio SR20 offers Bass (100Hz) and Treble (20kHz) controls which are adjustable from -10 to +10dB. Balance: The unit also allows you to balance the unit's speaker outputs left-to-right (+/-10). Front-Panel LCD: The Cambridge Audio SR20 stereo receiver features a front-panel LCD for the display of information, such as the selected input source, station identification, volume, and tone/balance level. Any issues with the different amperage, US is 15 amp, Europe is 20 amp outlet? I live in US. I live in US also. No problems. This unit will draw nowhere near 15 amps. No problem at all unless you load up the same outlet with multiple devices. nothing, no issues at all. I bought the receiver two years ago and live in the U.S. I have not had any issues with the amperage or anything else for that matter. No issues . I also live in the US . 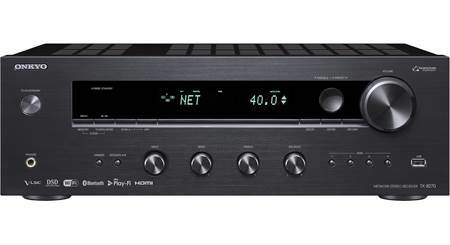 Does this receiver have inputs for an equalizer? 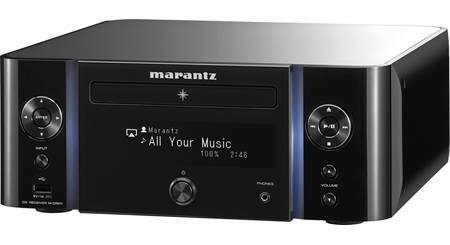 It has audio inputs which allow for any line equipment like CD/BD/DVD with inputs. Can't specifically say whether or not an equalizer would work. What I can say is this is the best, most powerful and cleanest amplifier I have ever owned. Awesome power and sound! Would buy again in a second. There are no inputs specifically for an equalizer. It has a 3-band built in. Can I run my TV and a DVD player through this receiver? Yes, I have my DVD hooked up so we can what movies and/ or listen to music. It's pretty basic. Hook up the DVD video to the TV and the audio to the receiver. When you want to what a movie, turn every thing on and choose video 1 on the TV input. Hope this helps. This is a great unit! Well - the answer is that depends - if your TV or DVD have RCA (red and white jacks) outs, then you could hook them up to one of the line inputs on this receiver. If they have an optical out it might be possible to use the optical in on this receiver (I say possible depending on the format used by the optical out on the TV). But if all you have is HDMI on your TV or DVD, this receiver has no input for that. I've asked questions at the Cambridge Audio website on this very piece of equipment and they were quick to answer and very informative. Thats what I do. It isn't a surround sound system though. It's just a simple excellent sounding stereo amp. Yes, but if you have an older TV you made need an adaptor depending on the types of audio out options you have. I run my TV, DVD, phono & Echo with no problems. Still has a few more input option available. Can the Topaz SR20 play both A and B speakers at the same time? Yes, provided all speakers are 8 ohms or greater. I have not tried it yet, but according to the manual, the answer is yes. "The use of A and B speakers affords you an easy and inexpensive way to create a simple multi-room system. 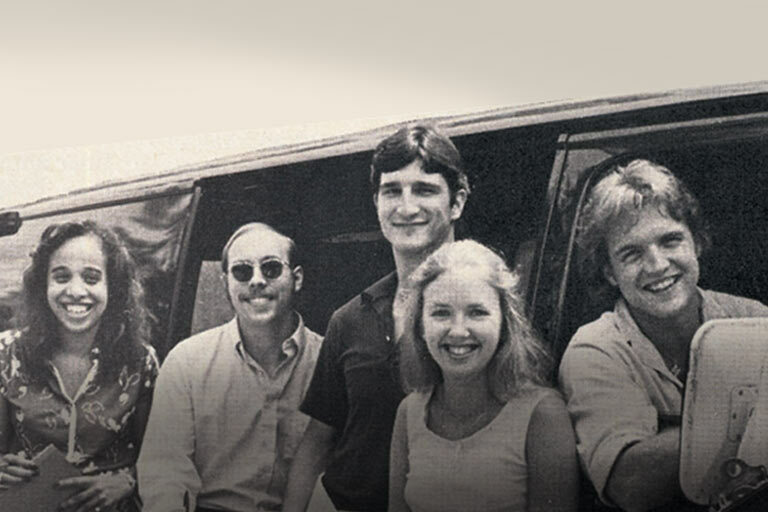 NOTE:When using two pairs of speakers, use speakers with a nominal impedance of 8 ohms." On the next page it says "The Speaker A/B button toggles between two sets of loudspeaker terminals. The options are speaker A only, speaker B only, speaker A and B together, and both sets of speakers off." Yes. The speaker select button allows "A", "B", "A+B" or "off"
Yes. From the manual (support section of the Cambridge Audio website, search on 'SR20') "Either A or B, or both A and B may be selected for use. Note: When using two pairs of speakers, use speakers with a nominal impedance of 8 ohms each." Does the sub output have a crossover or is it full range? If you click on details you will see that the sub out has a fixed 200Hz low pass filter. As far as I know there is no cross over. It is full range and doesn't have a gain either. However, my sub has those. I still like the receiver a lot. Sounds super good. I would recommend. Good Lord! I don't even know what the question means. Advise the customer to talk one of your appropriate technicians. I have, and they are very patient and knowledgeable. Is the headphone out a dedicated headphone circuit or is it based off a resistor coming from the speaker power output? I'm afraid that information is not provided for either of these Cambridge models. The only details on the headphone output state "The amplifier's speaker outputs are muted when headphones are connected; and headphones with an impedance of between 32 and 600 ohms are recommended" You may want to try contacting Cambridge's support directly for more details--you can reach them at 800-663-9352. How can I delete an FM station I inadvertently stored to a preset? If I try to overwrite with a different station on that preset number, the unit just goes to the next available preset number. Yes, you can turn it on and off using just the remote. It will also automatically "power off" if you don't play anything for a while. Leave it on stand by at all times. Use the remote to switch to power up. Yes. Just press the power button on the remote. You can send an email to Cambridge directly, but I believe the answer is no. The power switch on the back is a 'master' switch, and the one in front is a standby, and so is the one on the remote. So, you turn the power on in the back and leave it on at all times. It consumes almost no power (1/2 a watt) in standby. How would I play music from my iPad or laptop on this ? The mini jack in front panel ? Would it run thru the DAC that way ? You can use the front panel "MP3" jack to play from an iPod/iPad/iPhone. That's what I do. The jack is analog. The only digital inputs to the SR20 are on the back and are Toslink optical and RCA-jack S/P DIF digital audio. I haven't found a convenient way to get Toslink or S/P DiF off of an iDevice. There are cables to get TOSLINK from a Mac that plug into the headphone jack. PCs seem to be all different, so you can go hunting for a digital audio output adapter from whatever PC you have (if it's a PC). Searches related to the Cambridge Audio Topaz SR20 Stereo receiver.